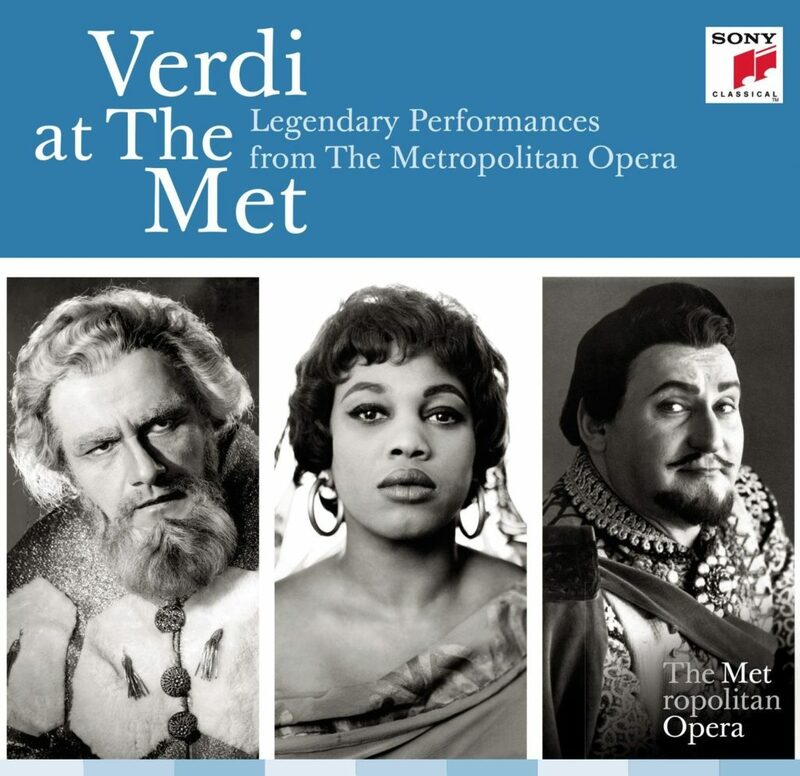 Verdi’s 200th birthday provided a good excuse for this boxed set of Metropolitan Opera performances that were broadcast live between 1935 and 1967. These have appeared in other editions, most “unofficial,” though UN BALLO IN MASCHERA and OTELLO were in the Met’s “historic broadcast” series on LP, issued for fund-raising purposes around 1980. All but two of these had been run by Metropolitan Opera Radio on Sirius/XM prior to release of this set, and the AIDA was also heard in 2005 as an “archive” performance during the Saturday network radio broadcasts. The sound quality varies, and as might be expected the 1935 LA TRAVIATA requires the most indulgence from the listener. The sound has been improved considerably from earlier copies, and while quite a bit of distortion from the source recording remains, noise and speed variation issues have been addressed. Applause after arias has been truncated, possibly when the original transfer was made years ago from the acetate discs, but the defects are worth tolerating to hear Rosa Ponselle’s Violetta, and Lawrence Tibbett when he was still in prime vocal condition. While sounding far better than the TRAVIATA, there’s a small amount of distortion in the 1945 RIGOLETTO, 1949 FALSTAFF and 1959 MACBETH. The RIGOLETTO seems an odd choice; the sound is a little dim and, as noted by the critics at the time, The Duke of Mantua was not one of Bjoerling’s better roles from a dramatic standpoint. But the voice is splendid, and Leonard Warren supplies plenty of drama. It’s also good to have an example of Cesare Sodero’s competent conducting, since he was busy at the Met in the early 1940’s, and his commercial recordings are not representative of his abilities, made when he worked as music director for the Edison phonograph company. The MACBETH, from the Met’s first production of the work, invites comparison with the commercial recording RCA Victor made with the same cast. The live performance has a strange acoustic, evidently not sourced from the microphones used for the broadcasts, providing more resonance than usual. The frequency response is good and the voices are captured fairly well, but the orchestra sounds like it was in another room. I’m guessing the microphones were above the stage, without a direct path to the orchestra pit. Distortion levels aren’t extreme, but do unfortunate things especially to Leonie Rysanek’s voice. While the voices and orchestra sound better in the commercial recording, it was made in the early days of stereo, emphasizing separation of the channels, distracting enough that playing it in monaural mode helps. Even so, the balance between singers is better in the live performance. The two from 1940 are especially attractive, being fine performances with interesting casts, and the sound is quite good with low distortion and a surprising amount of dynamic range. The OTELLO is very impressive, energetic and precisely executed by all forces under Ettore Panizza, with Martinelli’s voice captured far better than it was in the studio-recorded excerpts he made at the same time for Victor. The sound quality is also fine on the rest of the performances, with the 1950 SIMON BOCCANEGRA and 1952 LA FORZA DEL DESTINO excellent for the time they were recorded, and having little surface noise from the discs. I have a couple minor gripes about the editing. Scene and act changes happen without a break; I don’t expect commentary by Milton Cross, but a few seconds of silence would have helped. There is also no hint in the notes as to how these were presented in performance “at the Met” where RIGOLETTO and LA TRAVIATA were usually given in four acts. In a couple places the applause has been truncated; it may make some sense at the end of a disc side, such as after the tenor aria in Act III of LA FORZA DEL DESTINO, but there isn’t much excuse for dropping 30 seconds of it after “O patria mia” in the 1967 AIDA. Fortunately this only seems to occur in a few places, so I don’t consider it a major issue. The 136-page booklet has plot synopses of the operas and some information on events surrounding the performances, with the text in English, German and French, but very little technical detail on the recordings, other than for the 1935 LA TRAVIATA. The cast lists and pictures are probably the most useful parts of it. Access to the discs is somewhat awkward, since they are in cardboard envelopes arranged as folders. Squeezing the envelope open near the “spine” of the folder usually allows the disc to drop out far enough to grab the center hole, and the cut-out on the edge is an improvement over the similar packaging of the Wagner collection. At least the box doesn’t take up a lot of space, and the envelopes provide plenty of area for identifying the tracks on the discs. With ten operas in generally fine performances, this is an excellent release, a bargain at the price, and despite a few minor issues it is fully deserving of a 5-star “I love it” rating.